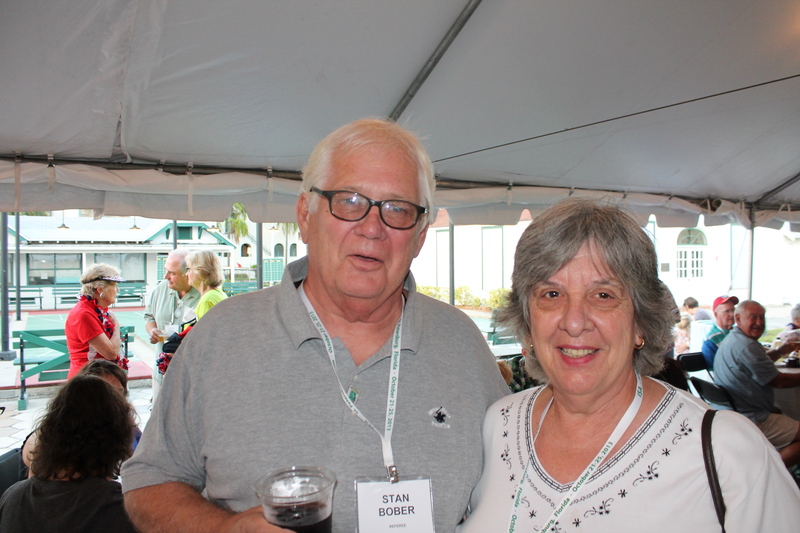 Citizens of Merit: Betty and Stan Bober. Serving Shuffleboard!! Stan Bober Speaks: I’d like to talk about Betty Bober. In my opinion, Betty is the most honest, competent, sincerest person I know. The other Tournament Directors often come to her for rulings, directions, how to’s, etc. and she has only been a Director for about 6 years. Her mentor was Barb Henson, (Hall of Famer Mickey Henson’s wife), and Barb still loves to come out of retirement to give Betty a hand on big State Tournaments where one has to keep track of Walking, non walking, men’s, ladies, and amateurs. Betty just retired from managing events in our park, Ranch Mobile. She was in charge of Thanksgiving Dinners, Christmas Dinners, in season monthly breakfast, Memorial and July 4th Dinners, you name it. I don’t know how she did it all plus Tournament Director and managed to play enough to make Pro about 2 years ago. She won a State Amateur Doubles Tournament a couple of years ago so she’s a natural shuffler but suffers from not playing enough to reach greatness. She also somehow manages to play cards 5 to 6 nights a week at our clubhouse. Betty retired after 30 years from AT&T and she said her job demanded total competence, error free work performance. She still strives for those goals even though her hubby’s pretty close to the opposite of those highly sought after traits. Stan Bober, WCD Webmaster. NOW, the “Other Stan” speaks: Any husband that can express that level of respect, even admiration, for his wife, CANNOT BE ALL THAT BAD. All readers know that Stan, the WCD Webmaster does a Great Job. Accordingly; I have included his name in the title and believe that both Stan and Betty have earned the title: “Citizen of Merit”. Stan McCormack 2018 05 04. 1 Response to Citizens of Merit: Betty and Stan Bober. Serving Shuffleboard!! I even left out a few of Betty’s activities such as: She’s on the West Coast District’s Executive Board and is its Secretary, Keeper of Records, and Preview Magazine Coordinator for the WCD, and secretary of our parks shuffleboard club. Plus she loves to do puzzles on a table in our living room.